As the Queen prepares to celebrate 60 years on the throne, here are my six housing generations and their very different experiences of six decades of housing market booms and busts. I wasn’t going to write a Diamond Jubilee blog as the ground has already been so well covered by Steve Hilditch and Colin Wiles and in the papers but then I read this Telegraph blog by Ian Cowie and I couldn’t resist. The Diamond Generation: People that were able to buy before the first wave of rampant house price inflation in the 70s. For an introduction, see the first episode of Dominic Sandbrook’s The 70s when it gets repeated for the generation that lived the home ownership dream in the suburbs, the savvy middle classes who bought the inner London houses that nobody seemed to want and the first wave of council tenants able to take advantage of the right to buy. The Golden Generation: Those able to buy before the late 1980s when house prices boomed again and who could take advantage of looser mortgage lending. Later on they were well placed to cash in on the first wave of buy to let. The Silver Generation: Those able to buy between 1988 and 1997. Many were a bit scarred by the boom and bust of the late 80s and early 90s and a bit slow to catch on to the start of the longest boom of the lot from the mid 1990s to 2007 but they soon caught up. In the wake of financial deregulation, the banks were falling over themselves to lend money and once this generation had got on the housing ladder along came buy to let and the chance to borrow even more to buy even more property. The Bronze Generation: Those able to buy between 1997 and 2005 – again they may have thought they had missed out, especially if they bought after 2003 but prices just kept on rising. However, they were increasingly reliant on a cash contribution from family in the Diamond, Golden and Silver Generations and flirting with negative equity if they bought in the wrong place at the wrong time as the credit crunch drew near. The Tin Generation: Those who mortgaged to the hilt to buy from 2005 onwards, or earlier in some places, and now find themselves without enough equity to move if they are not in outright negative equity. However, like any of the previous generations who still have a mortgage, at least they are benefitting from the record low interest rates that cut their payments and prevented a much more severe correction in prices and they do not have to pay extortionate rents. The Lead Generation: The really unlucky ones. The generation priced out by house prices, unable to get a mortgage since the credit crunch and stuck paying more than that in rent to a buy-to-let landlord (probably from the Golden, Silver or Bronze generations). Maybe they’ll get on the housing ladder with some family help or maybe they’ll swell the growing numbers of 20- and 30-somethings still living with their parents. 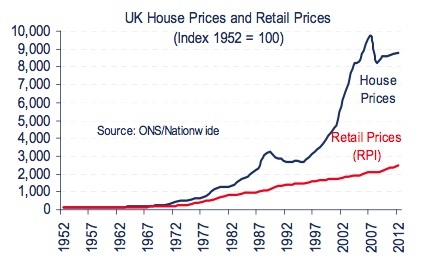 Sixty happy and glorious years of soaring house prices? Don’t make them laugh. That’s not the whole story by any means. It only covers home owners for a start and a similar story could be told of renting down the generations – and with plenty of hardships for the Diamond Generation there. It’s only a national average. But it’s an indication if any were needed that how you see the last 60 years of housing depends very much on the luck of when you were born. In 1952, in the wake of a war that left four million homes destroyed or damaged, we were building twice as many homes as now. Local authorities were building building more council houses then than builders of all kinds are managing now. In one way it shows just how much things have changed, in another it shows what can be achieved if the market is not providing and the will is there. Despite our current housebuilding crisis, the number of homes has grown far faster than the population over the last 60 years. In 1952, there were 14.1 million homes for a UK population of 45 million. In 2010 there were 27.2 million homes for 62 million of us. If you factor in the number of bedrooms in those homes too, it’s clear we have a housing distribution crisis as much as a housing crisis. In 1952, almost all mortgages came from building societies and there were 800 different ones. The story of six housing generations is also the story of the changing structure of the mortgage industry. Combine that with dramatic improvements in the condition of the stock and it’s clear that Housing 2012 is very different from Housing 1952. But if you think back to the Silver Jubilee in 1977 and maybe even the Golden Jubilee in 2002 it was possible to say that things were getting better for most people. It’s not possible to say that any more and for the Tin Generation, the Lead Generation and the one that follows who is to say that things will not look even worse by 2022 and a possible first-ever Platinum Jubilee? Quite right. And the Telegraph piece also talks about how things have improved with more “aqueducts”. Really? Show me how things have been permanently improved for the poorest class that has grown significantly with a middle class slowly disappearing into a life of dependency. Only the top rank have seen an improvement in general. Don’t forget there are a million empty homes and land for homes with planning permission held on speculation. Proof that building more homes would just mean more empty homes for diamond and gold speculators. Its more schizophrenia that the authorities think that developers add value to the economy through rising land prices. They only put up the buildings which depreciate immediately. The land values rise… always which is normal but as that increased value is privatised virtually tax free, that expectation plus a risk free “investment” initiates the boom cycle, which is then reinforced dramatically with loose land credit(mortgages) into a recession. The difference between now and then is today banks collect the “rents” as mortgage interest for providing land services and provide none, plus collect an extra speculative value during the boom. Banks are essentially the modern day land lord. Where it used to be traditional landlords that also privatised the land values as rents still provided almost zero land services but only collected the true not speculative increase in annual rental value. See here for a macro level view of this wealth divide taking place. Its always been like this, but with an increasing power to produce wealth in modern society due to technology, a great thing, has only allowed the gains to be appropriate by whomever currently is the big rent collector. Today its the banks. Mortgagees are merely tenants in modern day form. Thanks for the comment, Robin. So on that basis the Lead Generation would be tenants twice over – paying rent to their actual landlords to pay the mortgage of their landlords to the banks?